I love mornings. Apart from having a me-time at this hour, I am glad that my mornings are usually associated with delicious breakfast. Haha. Did I tell you that I love eggs? I really really do. Eggs are healthy, cheap, and tasty! I will put the photo here of my today's breakfast. Very simple but inshaAllah healthy. 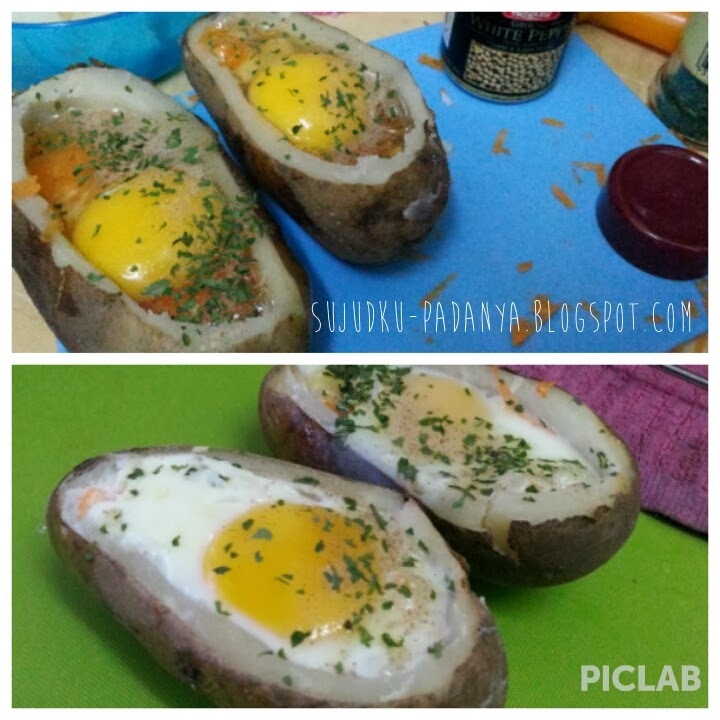 It depends on you what you would like to put inside the potato. As for me, I put diced onion, minced mushroom, a quarter slice of cheddar cheese and grated carrot. After I crack an egg on them, I sprinkle some parsley flakes and white pepper on it. Oh, before you stuff all those ingredients inside the potato, make sure you boil it first. After you are done stuffing it with whatever you like, bake it in the oven.